I’ve had it on Series Link since I first heard about it. The Great British Bake off had me stuck to the tv from the first episode (big kisses to my exceptionally talented friend Edd) and I had a feeling that the Great British Sew Off would be the same. I wasn’t disappointed! I’m a longtime fan of Tilly Walnes’ blog Tilly and The Buttons and thought her Tana Lawn pockets in her a-line skirt were super cute. If you want to learn to sew, her photo tutorials are fabulous. She hasn’t been sewing as long as Ann, the contestant with 75 years of experience (!) but you can see from her blog she knows her stuff. So it’s interesting to see the pressure that the show’s time limits exerts. Only one contestant, Sandra, got a lining done for the skirt and I imagine her grace in the firing line comes from having three daughters standing over her going ‘Is it done yet Mum?’ on repeat. 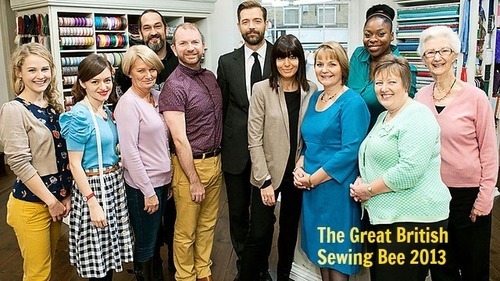 I found myself picking up tips from May Martin, one of the show’s judges along with the fabulously dapper Patrick Grant. We love a neat pocket square in this house. The lovely soft light cotton that Sandra chose had to have a lining because its inclination is to fall in toward the body so that won’t maintain the shape of the a-line they’d been directed to make. Doh. Scottish Lauren with the fabulous lilting accent is half of the duo behind this rather marvellous looking bricks-and-mortar and online store, Guthrie and Ghani. Anywhere that stocks Denyse Schmidt’s Flea Market Fancy gets my seal of approval. Mark the HGV mechanic totally pulled off the surprise of the evening with his perfectly fitted two-tone dress, with his perfectly fitted fourth-ever zip. Git. Although wouldn’t he have practised that dress at home? What are your favourite patterns for beginners and rusty crafters like me? PS my one bugbear – can we please encourage the use of “sewist” rather than the other word they’ve been using for the contestants? While it sounds fine when spoken, nobody wants to be described in print as a home sewer, honestly now.